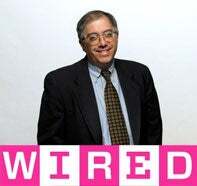 Steven Levy is a notable tech reporter because of his intimate access to new Apple gear and long history of non-tech reporting to back up his relative-to-the-world lightweight beat. He's long been associated with Newsweek. But now, Wired, who he's written for many many times before, just picked him up as a staff writer. Stupid Newsweek! Difficulties between Apple and Wired have been patched up since the This is the Phone of the Future Cover?, mocking iPod ads and kicking the iTunes compatible Moto ROKR while it was down. But will Levy's famous Apple access follow to the new pub? I haven't asked, but I'm sure Apple will decline to comment. My guess is that it will. Valleywag also chimes in with rumor that Newsweek, in an attempt to trim its headcount, is paying up to two years salary for people to voluntarily depart.